I recently discovered how easy it is to bake a chicken. Just cover with oil and herbs then stuff with citrus and herbs and bake. 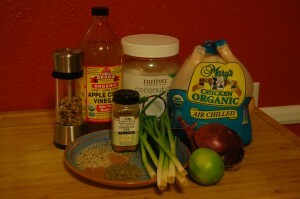 Then I took it a step further with this Caribbean Jerk recipe and a marinade step. With only 20 minutes of active prepping and voila, an entire Caribbean jerk chicken baked for you, your family, your friends, and maybe the neighborhood to enjoy! It makes so much chicken when feeding one person! Plus the brand I buy comes with some organ meat that my dog loves much more than I do. Once I cook this chicken I have plenty for the week. You might even incorporate some of the shredded chicken into another recipe, like a chicken salad or barbecue chicken sandwiches. And remember, cooked chicken bones can be dangerous for dogs to eat so best give your dog something else to chew on, like an organ or two mixed with their dinner! Mix the red onion, green onion, cinnamon, thyme, allspice, salt, pepper, nutmeg, jerk spice mix, butter/coconut oil, and the apple cider vinegar/spiced rum into a food processor and blend until it forms a paste. This usually takes only 10-20 seconds. Rinse and cut the lime then squeeze the juice of ½ the lime over the chicken and rub it in. Rub the jerk seasoning paste over the chicken and marinate a few hours to overnight for better flavor. 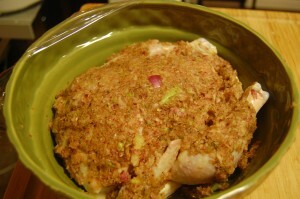 Once the oven is hot, place the chicken in a large roasting dish and place in the oven. A dish with lower walls is better because it traps less steam and will keep the chicken from getting too soggy. Cooking time averages 45 minutes to an hour but cook until the chicken is cooked through. You know it’s done when the juices coming out of the chicken are clear and the internal temperature is 180 degrees. The drumsticks will also move easily in their sockets. Take out of the oven when done, cover, and let sit for at least 5 minutes. The juices will integrate and keep the meat moist and juicy.